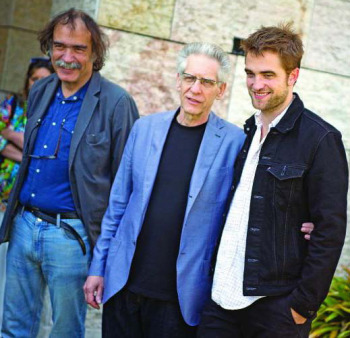 Director David Cronenberg and actor Robert Pattinson were at the Centro Cultural de Belem in Lisbon, this Tuesday, at the press conference for the film 'Cosmopolis', produced by Paulo Branco, while dozens of fans were waiting outside the premiere, scheduled for this night. 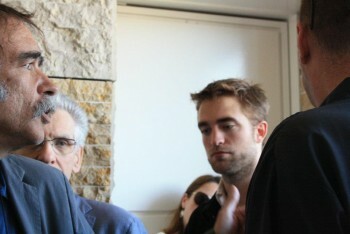 The film, - which premiered in the Official Selection of the Cannes Film Festival in France last week, but didn't win any prize - will have it's second public screening in Lisbon, for a premiere at the CCB at 8:30PM, with the appearance of Cronenberg and the movie's lead actor, Robert Pattinson. There is another premiere scheduled, at 10PM at Monumental Cinema, also with the presence of both. During a meeting today with the press, the Canadian director and British actor, accompanied by producer Paulo Branco told us some details about the shooting of the film, an adaptation of the novel by Don DeLillo. At the entrance of the CCB, where a red carpet is already set, about twenty Pattinson fans at 12PM, were already waiting for tonight's premiere. Among them were four Spanish girls from Valladolid, that are there since Monday night. 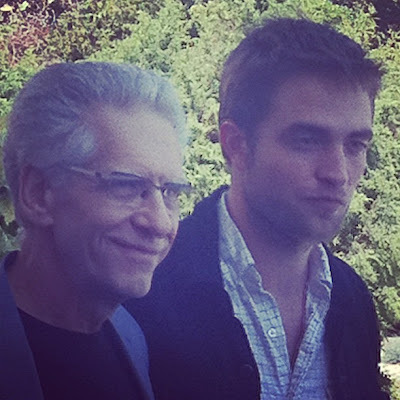 'Cosmopolis' is the first film where Robert Pattinson worked with David Cronenberg, after being the lead actor of the vampire saga "Twilight," a worldwide box office success. Robert Pattinson plays the role of a millionaire, Eric Parker, who want to go across New York in a limousine to get a haircut. The trip, that lasts a whole day, is a metaphor about his life and his selfdestruction until a final confrontation - a crucial dialogue in the movie - with a former employee (played by actor Paul Giamatti). "The dialogues from the book were what gave me the certainty that this could be a movie. They were dramatic, interesting. Don DeLillo wrote very specific dialogues and I transcribed all of them for [the script], "Cronenberg said. 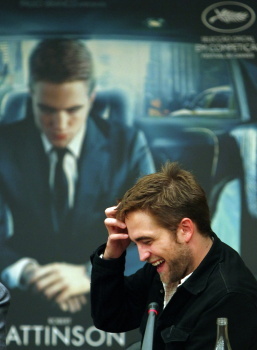 Robert Pattinson, who has in "Cosmopolis" the first major dramatic role of his career, admitted that he was "scared" at the beginning because he didn't know if the movie would work, since it had too much text, the story is set inside a limousine and he's in almost every scene. 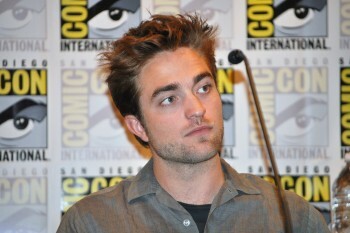 Now that the movie is done, the actor admits that he thinks about acting and cinema differently. Pointed as one of the actors that will be on the sequel of "The Hunger Games" [Note: he already denied those rumors] we don't know much about his future projects. Pattinson says that he doesn't know what kind of characters he would like to play in the future, but that he has a wish: "I just hope to play good characters." 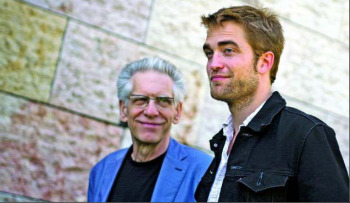 Cronenberg caused a hearty laugh at the press conference when he said that he chose Pattinson because "he was very inexpensive, he was available and would follow the director's orders." 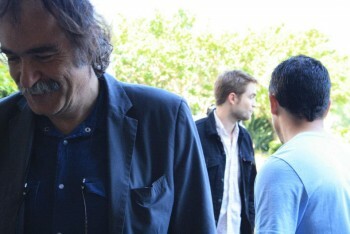 "I saw some of his interviews on Youtube and I noticed his sense of humor. We had fun filming, even though it's a dark movie (...). I had to kind of convince him, but not to convince him it would be an interesting movie, but to convince him that he was the right one to do the role," he said. David Cronenberg, 69, director of movies like "Videodrome" (1983), 'The Fly' (1986), "Crash" (1996) and "A History of Violence" (2005), said he is still digesting everything that the film represents. 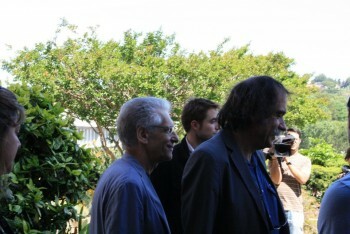 "We showed the film at Cannes and it was the first time I watched it with an audience. I Still don't know what the movie brought to my life, but it already made a difference. We have been quoting parts of the movie. The movie means many things," he said. This was the first time that Paulo Branco worked with David Cronenberg, to whom he suggested the adaptation of the novel by Don DeLillo. 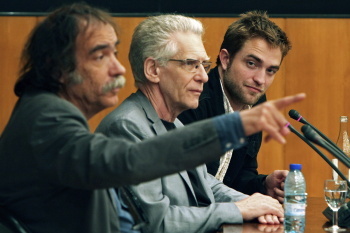 'Cosmopolis', that will be released in Portugal on Thursday, is considered an independent film, with a budget of 15 million euros. Rob and David Cronenberg answered questions from the press in Portugal today. 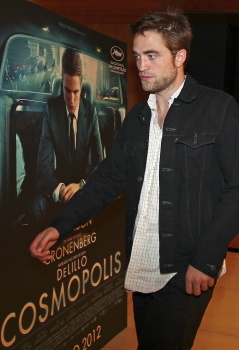 The Cosmopolis premiere is scheduled for 8pm local time (3pm EST). There's no live feed that we know of, but we'll be bringing you the latest pics, videos, and everything else from Lisbon! 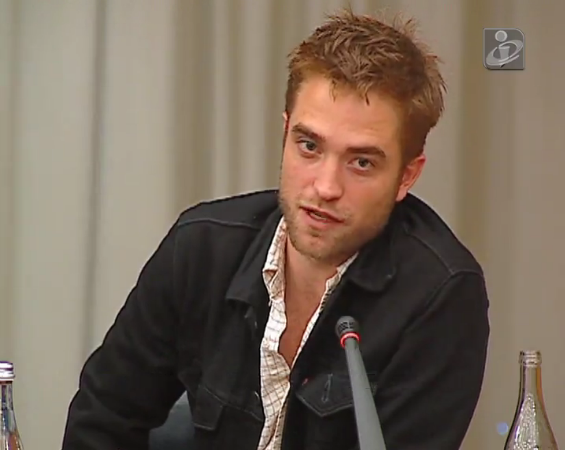 Rob: To make this on the year that I finished Twilight was a blessing. And it made me think that if you like something, you should do it. It's not worth it to doubt ourselves. 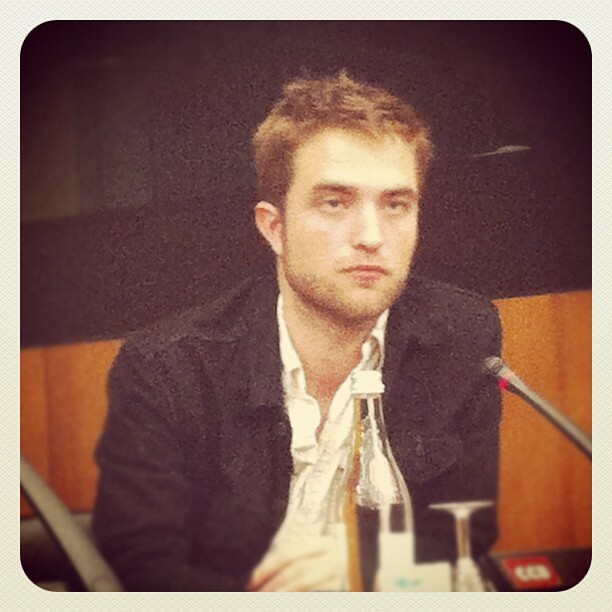 "The hardest part was the initial stress before I started filming 'Cosmopolis', but soon the fear was gone," Robert Pattinson told journalists at the CCB. Outside, since early morning, dozens of young fans of the "vampire" from the 'Twilight' saga, lined up around the barriers surrounding the red carpet - where there will be a premiere, starting at 8PM - waiting to see their idol. 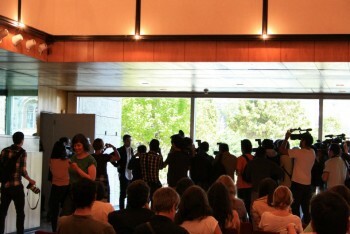 They didn't know that at that very early on (11:30AM), he was already inside the building. "We brought a t-shirt to give to him. 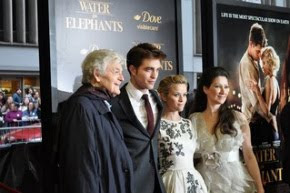 I don't know if I will be able to say something when see him," said the two fans, Patricia and Sandra, creators of the site 'Twilight ao Amanhecer'. The t-shirt could not be more clear about the feelings towards the actor: 'Keep Calm and don't forget to be awesome'. Pattinson is calm, in the press room when he tells the journalists that he's aware that "this role is very different from his character in Twilight. "It was a gift," admits the actor who knows he is idolized by millions of fans. "I care about what everyone thinks. I know that many young girls will see the movie and I hope everyone enjoys it." David Cronenberg liked to film. The film. And the actor. 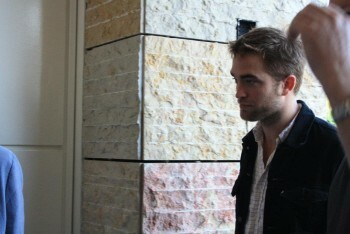 "It was all fun and Robert Pattinson is a great actor", he said. Outside, Patricia, Sandra and all their friends that came from various parts of the country, as well as others, that came from Spain, would like to be heard. "If I can, I'll give him a hug," said one of the girls. The day will be devoted entirely to wait for the premiere, and while they can't see the 'vampire' of their dreams, they run to anything connected to the idol.